SEQUIM, WA-Not for a long time has there been such a need for increased public spending to create jobs and rebuild infrastructure, not least here in Washington State saddled with 9.2 percent joblessness. Yet right-winger, Tim Eyman, has placed on the Nov. 3 ballot a referendum, I-1033, that would force even deeper spending cuts than those already imposed across the Evergreen state. The plunge in consumer purchases has meant a collapse in sales taxes, the state’s main source of revenues. I-1033 would freeze state, county, and municipal budgets at the previous year’s level plus population growth and the national inflation rate. A coalition of 60 organizations including the AFL-CIO, the American Association of Retired Persons (AARP), the Washington Education Association, Sierra Club, the Greater Seattle Chamber of Commerce, and Microsoft, has come together to fight I-1033. • Seattle opened its light rail system, easing traffic congestion, reducing the city’s “carbon footprint” while generating hundreds of union-wage jobs. • The keel was laid at Todd Shipyards for a new 64-car ferry for the Port Townsend-Keystone run, one of twenty auto ferries in the Washington State Ferries (WSF) fleet. Todd has just won the bid to build two more ferries, a lifeline for shipbuilding that employs thousands in the Puget Sound region. • The ribbon was cut on a new bridge across the Elwha river replacing the single-lane span built in 1914. The lower deck is a pedestrian walk-way, part of the Discovery Trail that follows old abandoned railroad right-of-ways. When completed, it will stretch well over 100 miles from Port Townsend to Forks and on to Lapush. • Preparations are underway to take down two dams on the Elwha, an effort to restore the salmon and steelhead fish that once teemed in the river. This project was speeded up by an entire year when millions from the Obama stimulus package was earmarked for the dam removal. 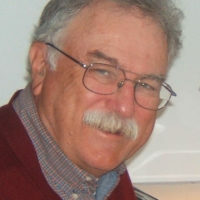 • A leader of the Salmon Coalition on the Olympic Peninsula hailed Obama’s package. They were able to hire nearly 50 young people in restoring spawning beds in rivers this summer, a mini-CCC project. There were unusually large runs of pink, silver, and king salmon in the rivers this fall. It generates enough electricity to supply two cities the size of Seattle, all of it free of greenhouse gases. Water from Lake Roosevelt behind the dam irrigates half a million acres that supplies the nation with some of the sweetest fruits and vegetables. Grand Coulee Dam and more than 30 other dams on the Columbia River and its tributaries has powered the development of the entire Pacific Northwest generating tens of thousands of jobs. It also provides electricity to households through Public Utility Districts (PUD) that is cheap and reliable. It is all publicly owned, creeping, or should we saying galloping “socialism” that enrages the tea-baggers. The dams came with a heavy cost: wiping out the salmon and steelhead runs that once spawned upriver from Grand Coulee Dam, ending a way of life for the Native American Indians united in the Colville Confederation. Redressing those injustices means restoring the salmon and steelhead runs. In some cases, it means removing the dams. That too will require billions in public funding. We stopped at the Wanapum Dam further down the Columbia operated by the Grant County PUD. 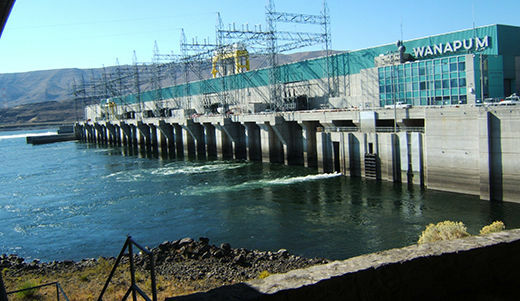 Susan Parker, docent at the Wanapum Interpretive Center, told us people are being paid wages to count the salmon and steelhead swimming up the fish ladders beside these dams. Engineers, she said, are working to redesign the turbine blades in the generators so the salmon fry can swim through them unharmed. Saving the salmon may turn out to be as labor intensive as building the dams. But it is an investment that will pay huge dividends. That project is put at risk by Eyman and other “fiscal hawks” who know the price of everything and the value of nothing. Vote No on I-1033. It is a vote to save the salmon. Photo capition: View of the Wanapum Dam, named for the Wanapum Native American Indian nation that lived along the banks of the Columbia River.